As many of you know, we are buying a house in Eagle Mountain. We are just in the construction phase, but it is very exciting! We go out and visit the site at least once a week, and we were ecstatic when they finally dug the hole for the house. Then we were even more excited when we discovered that they had poured the foundation the next week. When we visited on Tuesday of this week we were thrilled to see that they had put up the walls! I will continue to publish photos so everyone can see them. The Base has been Completed!!!! I know, I've taken forever... But the base of the LEGO General Grievous is now complete. 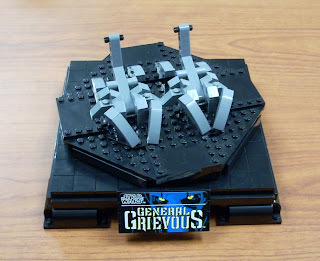 At first I was disturbed that I didn't get to build the actual General Grievous, but then I realized that he did need a place to perch since his footing was never really solid. The base is pretty solid, and would most likely support the weight of the Star Destroyer model (which I want to do next). The main part of the base consists of 195 LEGO pieces, 32 of which are dedicated to the solid footings underneath. At the top, there is a swivel platform with the General's feet built right on it. The platform itself is constructed with 65 pieces, then another 96 pieces for his feet. Welcome to my personal blog. Feel free to comment on any post. I have recently created a document outlining my current endeavors. You can find it here: History of Endeavors. Also, check out Programs I Like.